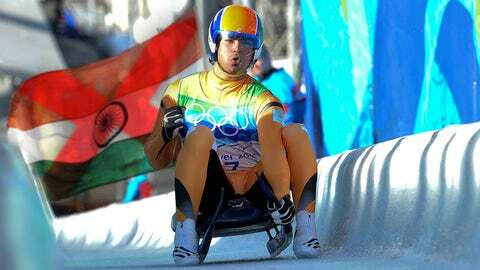 No flag, no problem: Indian Shiva Keshavan luges for his country despite a ban on the flag. India’s top competitor at the upcoming Winter Olympics in Sochi says not being able to compete under the national flag because of a political dispute will not harm his performance. "In my heart and mind I’m competing for India," luge competitor Shiva Kesavan told The Associated Press in an email interview. "Every day I’m flooded with messages from Indians all over the world telling me they are supporting me. This is enough to push me forward." The Indian Olympic Association was banned in December 2012 on accusations of not adhering to its own constitution and electing tainted officials. Though the IOA has redrafted its constitution as directed, the ban can be lifted only after post-Sochi elections, so the Indian flag will not be used at the Feb. 7-23 games. "I’ve never been motivated by external fame or attention. I love my sport which is why I have been doing it for 17 years. If I do well, people will notice. My focus is my sport," said the 32-year-old Kesavan, who is competing in his fifth Winter Olympics. Kesavan, who set an Asian record of 49.590 seconds in the Japanese city of Nagano in December 2012, conceded that winning India’s first medal at the Games may not be realistic. "A medal is my aim but seems just a little out of reach at this time," Kesavan said. "I’m simultaneously working with my in-house engineering team to build a sled which will be hopefully the fastest I have ever been on. But this will take some time to develop. Right now, I have to focus on getting four clean runs in Sochi, and be the fastest I can." "This season did not go according to plan due to lack of high level technological inputs, which I had hoped to get on time from certain companies. However, this has not deterred me, and I am determined, as always, to put up my best performance." The other two Indian competitors who will participate in Sochi are alpine skiers Himanshu Thakur and Nadeem Iqbal.